A transport group on the Isles of Scilly is calling on the government to help pay for a hard runway at Land’s End Airport. The airport has just opened a new £1m passenger terminal at the airport. The Friends of the Isles of Scilly Transport say islanders suffered badly when Land’s End was waterlogged for 2 months and they need a hard runway which would cost about £1.5 million. They also say it would be “an awful lot of expenditure for the company to take on” and so want government money. The DfT said it could not yet comment “as no request for help in funding has been received.” Earlier in the year, plastic mats were put down to strengthen the grass runway and flights were diverted to Newquay. A transport group on the Isles of Scilly is calling on the government to help pay for a hard runway at Land’s End Airport. It comes the day after a new £1m passenger terminal opened at the airport in west Cornwall. The Friends of the Isles of Scilly Transport (FRIST) said islanders suffered badly when Land’s End was waterlogged for two months. The Department for Transport (DfT) said it was currently unable to comment. A survey has been done and plans are now being drawn up for a hard runway which would cost up to £1.5m. The Isles of Scilly Steamship Company (ISSC), which owns the airport is keen to build the runway, but it has already spent £1m on the terminal. A new aircraft is expected to arrive later this month. Mr Francis said the runway would be “an awful lot of expenditure for the company to take on”. He is calling on the government to help pay for the runway for a “lifeline service”. “This is very crucial for all sorts of reasons for the islanders, like health visits. ISSC is now the sole provider of commercial flights to the Isles of Scilly after British International Helicopters stopped its year-round service in October following financial problems. The Scillonian ferry only runs during the summer months. The DfT said it could not yet comment “as no request for help in funding has been received”. Plastic matting is to be installed over the grass surface of the Land’s End runway to allow flights to resume between the Isles of Scilly. Flights have been redirected to Newquay Airport since mid December due to heavy rain over the last month. The Isles of Scilly Steam Ship Company’s Skybus service said the matting would help to “reinforce the surface”. The plastic matting will be installed over the next few weeks. 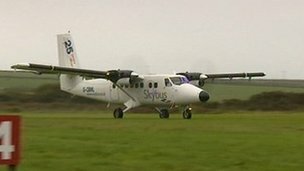 The company said it was working with the Council of the Isles of Scilly on a longer term solution by securing the necessary money to pay for an upgrade to the runway. After the withdrawal of the helicopter service from Penzance, Skybus has become the last link from Cornwall to the Isles of Scilly. The islands, which have a population of 2,200, have flights six days a week in good weather. A passenger ferry, the Scillonian, only runs in the summer. Mike Hicks, the chairman of the Council of the Isles of Scilly, said he was “already worried” about next winter. He plans to meet with the Isles of Scilly Steamship Company to discuss the possibility of the major Scillonian re-fit being speeded up so the ferry can sail next Christmas. Posted: Wednesday, April 10th, 2013. Filed in News about Airports, Recent News.